Perfect bird for beginners in poultry. Very docile and love to be petted and are well known as the favourites for kids due to there size and their feathery feet! I am breeding this iconic breed with a bit of a twist this year. I managed to get a lovely copper frizzle Pekin cockerel called Chuckie. The frizzling in the feathers are due to a mutation in the birds genes. 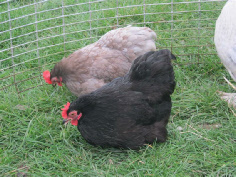 Frizzle is where the feathers stick out into a perfect ball of feathers. Chuckie this year will be running with 5 smooth feathered girls. This means if you hatch a egg there will be a 50% chance that the chick will be frizzled. This flock is made of great standard Pekin. The colours in the flock are black, copper, blue, lavender and white. This means the flock has the potential to through out pure colours like black and copper. These birds are small and don’t need space. They are good for back gardens as there feather feet and their light weight means it is hard for them to scratch and course damage to your precious flowers or plants. Perfect for urban chicken keepers with children. To the right they are pictures in the gallery are of Pekins. The two smooth cockerels you see un-fortunately got killed by a fox so I had to source Chuckie. The little frizzle in the picture is Chuckie. He is full sized know and I will be updating my picture constantly on this website. The chicks I hacthed out last year. 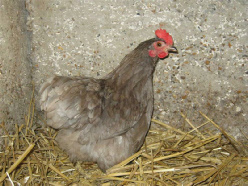 I bought a breeding goup last year and this year the hens will be in their second season. I will sell hatching eggs and adult POL birds from this flock. Keep an eye on the for sale page. They are fantastic broody’s which means they are on the easiest to hatch.